My regular get-together with the directors of the Bay Area’s congestion management agencies featured a lively discussion of the Regional Measure 3 legislation (SB 595). I attended another field hearing of the national committee studying the future of the Interstate Highway System. This one was in Chicago and focused on goods movement. The California Supreme Court has ruled in favor of the San Diego Association of Governments (SANDAG) in a challenge to its approval of that region’s first Sustainable Community Strategy. As is usually the case in California, the legal battle was fought on the much-contested terrain of CEQA, so the decision is somewhat mind-numbing to read. The Legislature has passed a 10-year extension of the state’s cap & trade program through 2030 by the requisite two-thirds vote margin. In testimony before a state senate committee, Governor Brown called the measure “the most important vote of your life”. I joined Brian Mayhew, Susan Woo and our banking team in making presentations to the three major bond rating agencies in preparation for a potential $1 billion re-funding of prior debt issued by the Bay Area Toll Authority. The technical committee for our CASA housing initiative met for the second time in Silicon Valley and discussed how to fashion and pursue its ambitious work program. The steering committee for CASA – which includes Commissioners Cortese, Liccardo, Mackenzie, Pierce and Schaaf – will meet for the first time directly after the Commission meeting on September 27th. I thought the Commission would be interested to know that I attended my first set of ABAG committee and board meetings last week since the staff consolidation on July 1st. Commissioner Pierce presided over the board meeting, where the major item of business was the process underway to stand up a new conduit financing enterprise to serve local governments in the Bay Area. Starting in September, I intend to transition this Executive Director’s report into a document that would inform both the MTC and ABAG boards of recent executive staff activity. Last Friday was the gala celebration for a project that has been nearly three decades in the making: the electrification of the Caltrain commuter railroad. There were many speeches from elected officials at all levels of government – ranging from Governor Brown to Chair Mackenzie – and a great time was had by all. 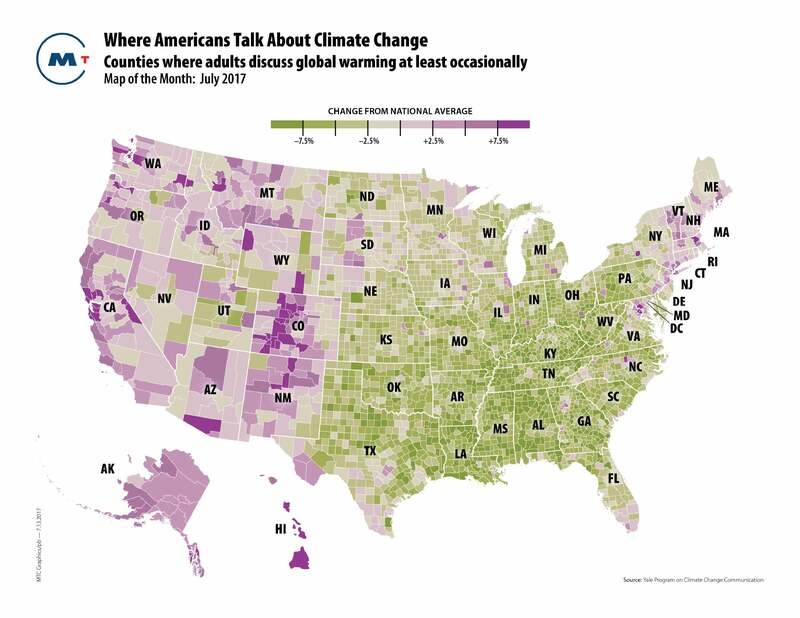 This map is based on a recently published New York Times article, which found that on average, only 33% of Americans discuss global warming at least occasionally with friends and family and up to 31% never do. As shown in the map, there are distinct regional patterns. Americans in the western U.S. many of whom have been affected by drought and wildfire, are more likely to discuss climate change. Similarly, Americans residing in the New England states talk more about climate as well as those living in the coastal Carolinas – states battered by many hurricanes over the years. Aside from southeast Florida however, the rest of the Atlantic Coast is less likely to engage in climate discussions despite recent increases in global warming related flooding. As the article highlights, global warming is precisely the kind of threat humans have difficulty dealing with due to its slow-moving and abstract nature.